Review – Rescuing Harley by Susan Stoker – 5 Stars!!! Harley and Coach never expected their day to bring a world wind of events that would literally drive them in to each other’s arms. Will fate be kind and give them the happy ever after they deserve or will it rip it away in the blink of an eye. 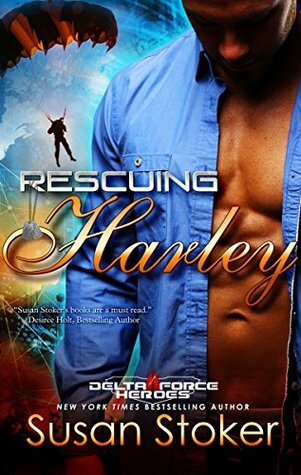 I am loving this Delta Force Heroes series by the greatly talented Susan Stoker. This team of military men not only remind me of the awesomeness that is the Seal Team from her Seal of Protection series; they also have their own uniqueness and quirks that are undeniably addictive. I can’t deny that they are all finding their very own place within my heart. Coach is 100% addictive! He has a heart of gold, a heart full of love and respect. It’s clear although he is strong, loyal, and has a stern yet caring personality, that the man deep down is holding on to heartache and pain from his past and it is that which as shaped him to be the man he is. Harley is brilliant! She is funny, caring, easy going, upfront and isn’t ashamed of who she is or to be the person she is; although it’s clear she much prefers the quite life and to be unnoticeable. She also has a determination about her and no matter what challenges life throws at her, she will fight to win, every time. This story had me hooked from the very beginning, until the very end! I fell in love with Harley and Coach within minutes of meeting them. Their story is both beautiful and full of heartache. They had a rocky start to their relationship and without any doubt their path was not an easy one. Fate toyed with them and it broke my heart to see them both in so much pain. Just when you think they have found their path, fate threw a curve ball that has you sat on the edge of your seat with tears in yours eyes hoping that their story doesn’t meet a bitter end. Without any doubt, I absolutely loved Rescuing Harley by Susan Stoker! If you love military romances full of suspense, you must give the Delta Force Heroes series by Susan Stoker a try. Each book can be read as a standalone, although for me personally I love reading them in release order to get the full enjoyment from the series.